Launching September 2014, Bed Head by TIGI have four very exciting styling products arriving in salons and on shelves that I got a sneak peek at the Cult Creations range this week. Taking styling to a new dimension; flexing the hold, making strong strong and shine shinier, along with giving you the power of dazzle. Plus they look really flippin' cool and glow in the dark! Having had the chance to try them out at the event, I thought I'd give you a little info, with full reviews on each to come later in the month. I'm a huge fan of Bed Head products, especially Rockaholic Fun Times Hairspray and After Party so I've got high hopes for the Cult Creations products. So what are the products? And what are they promising? 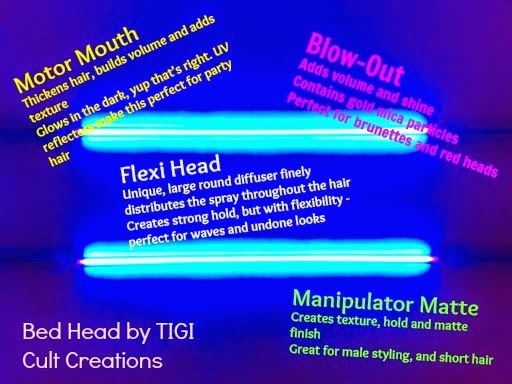 Take a look blow below and see which takes your fancy. I'm pretty excited about Motor Mouth. Blow-Out is an 'Ibiza' version of After Party and Flexi Head promises undone styles with hold. What's not to love!